Eating lobster is not a refined pastime. It should not be an exercise in etiquette. A picnic table with a newspaper cover to catch the shells is the perfect setting, a seaside lobster shack	the best location. However it is cooked, your lobster will be very hot and if it has been boiled or steamed (the most common cooking method), it may be full of hot water. Give it a few minutes to cool so you don't burn your fingers or get scalded by boiling water when handling it. The ease of eating a lobster depends partly upon the time of year. Lobsters moult (shed their shells) every year in early summer. Just before shedding (May or June) their shells are thick and hard, and their claws difficult to break open. Just after moulting, their shells are as thin as heavy paper, their claws easy to open without tools. 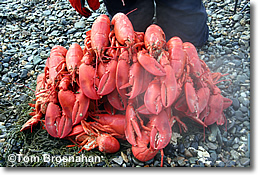 The shells harden within a few weeks after moulting, but an August lobster is still much easier to eat than a May lobster. — A claw cracker (like a nut cracker) to crack the claws so you can extract the claw meat—a delicacy. — A "bone dish" in which to deposit empty shells and picked-over parts. Here we go: hold the body in one hand and the tail in the other, and break the tail off with a side-to-side motion. Holding the tail upside-down, stick a fork (upside-down) between the bottom of the shell (now facing upwrds) and the tail meat and pull the whole chunk of tail meat out. The tail is the largest meaty portion of the lobster, but there's lots more. Each claw should be broken and the meat taken out with the small fork or lobster pick, even from the joints that connect the claw to the body. This is the most delicious part, a real delicacy. In larger lobsters (1-1/2 pounds and over), you'll find tender little bites in other places too. Twist the four "flippers" off the end of the tail and chew out the delicate meat inside. Twist off each small leg: in the knuckle next to the body there's a nugget, and you can chew tender meat out of each segment in a leg. Diehard lobster-lovers (I'm one) go even farther. Tear the carapace (the hard body cover) off, split the body lengthwise, and behind where each leg was attached there is a good bit of meat. Of the innards, the gray-colored liver (called "tomalley") is edible—chefs sometimes use it in sauces, though not everyone likes it. If you find a waxy red substance in your lobster, you have a female: it's roe (eggs), edible but not choice. By now you will have discovered that eating lobster is not a refined pastime. The image of the lobster as an item in haute cuisine is justified by its delicious flavor. But simple steamed lobster cannot be improved by even the most creative chef, and eating it should not be an exercise in etiquette. A picnic table, with a newspaper covering to catch the shells, is the perfect setting; a seaside lobster shack or windjammer shore picnic the best location. Want to know all about lobster? Read this book. Above, steamed lobsters hot from the pot.